The PNF Figurines Austalia range of high quality 100% Australian made 54mm figurines depicts the Defence forces of the Commonwealth and other Countries. Classified as Elite or Connoisseur figurines, they are cast in pewter and are available painted. 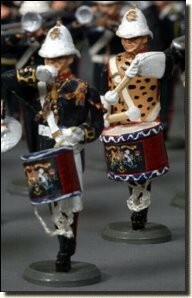 Our figurines are unique in clarity, features with exclusive productivity - proper coat of arms and drum cords on our drums and accurately reproduced flags. We offer a Lifetime Unconditional Guarantee. If a figure gets broken or damaged, return it to us and for the cost of the return postage, we will replace the figure. 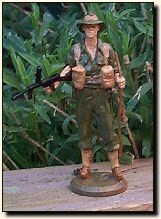 All figurines are individually hand painted, featuring realistic and authentic detail. * NOTE: Colours on figures may vary due to different die batches in paints.